Jillian Cantor has a gift for putting emotions and feelings into words in a way that feels so real and true to life. It doesn't necessarily matter that I have not experienced the exact situations her protagonists have, they are still voicing universal life concerns that I relate to. Out of millions of writers in the world, it still feels rare to find those authors who speak the unformed words of your heart and for me, Jillian Cantor is one of them. Her books brim over with emotional truth. The Transformation of Things is about Jennifer Levenworth who is living a privileged life in the suburbs when she finds out her husband, a judge, has been indicted on bribery charges. A woman named Ethel offers her some herbal remedies. Jen takes them, but soon starts having dreams where she is inside the minds of her neighbors. She quickly learns that what is on the outside is not always the same as what is on the inside, and her eyes are opened to appreciating what she has in her own life. 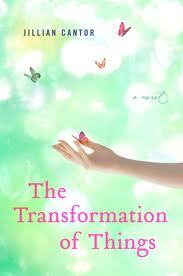 I think what I loved about this book is that it's about transformation. Jen starts out feeling and thinking certain things in her life are her priority but they aren't bringing her joy. When things get shaken up, at first she's upset but slowly she begins to view things in a different way. There comes a point in the story where she must decide what she knows for certain, what is most true. It's about stripping away everything else, all the pretense, all the expectations and crap of life that get buried on top and finding what makes your heart beat underneath it all. She's deeply wounded and scared of life and she has to confront that and make the choice to live. And part of that process is learning that everyone has their own disappointments in life, their own desperation, their own hurts that drive them. So it's sweetly hopeful in its own way and sometimes that's what I need most in a book. I need the reminder that there's a life worth living, one life that's mine. In reading reviews of this book, I saw a lot of people were disappointed by the ending, but I was not. But I'd like to offer the suggestion that the book works on several levels of being about 1) Not everything is what it appears to be on the surface and 2) We have to choose to live our lives and do the work to transform. "With time on my hands I'd become a neat freak, and I felt a little jealous looking at the mess, at the sloppy way life could unfold, could strike you in insane and beautiful ways that you would sometimes not expect..."